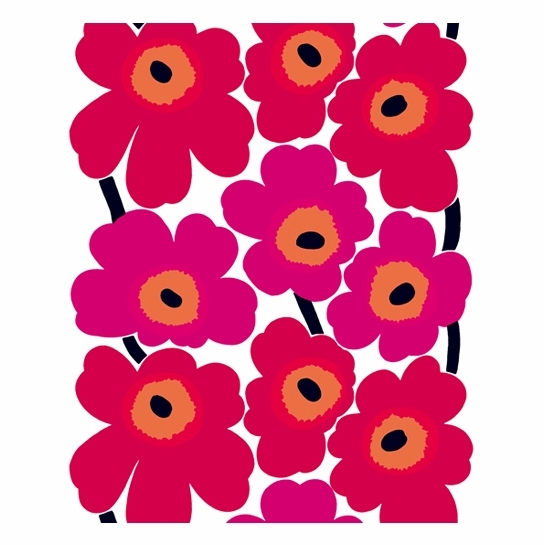 More about Marimekko Unikko Red / White Fabric Unikko in its original red on white colorway is perhaps the most iconic Marimekko pattern. Designed by Maija Isola in 1964, the powerful poppies are still recognized and celebrate a century later for their timeless appeal. 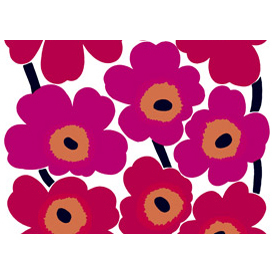 Use this 100% cotton fabric to bring the world's favorite floral pattern into a room through a wall hanging, curtain or table linen. See secondary image for approximatio of one yard. 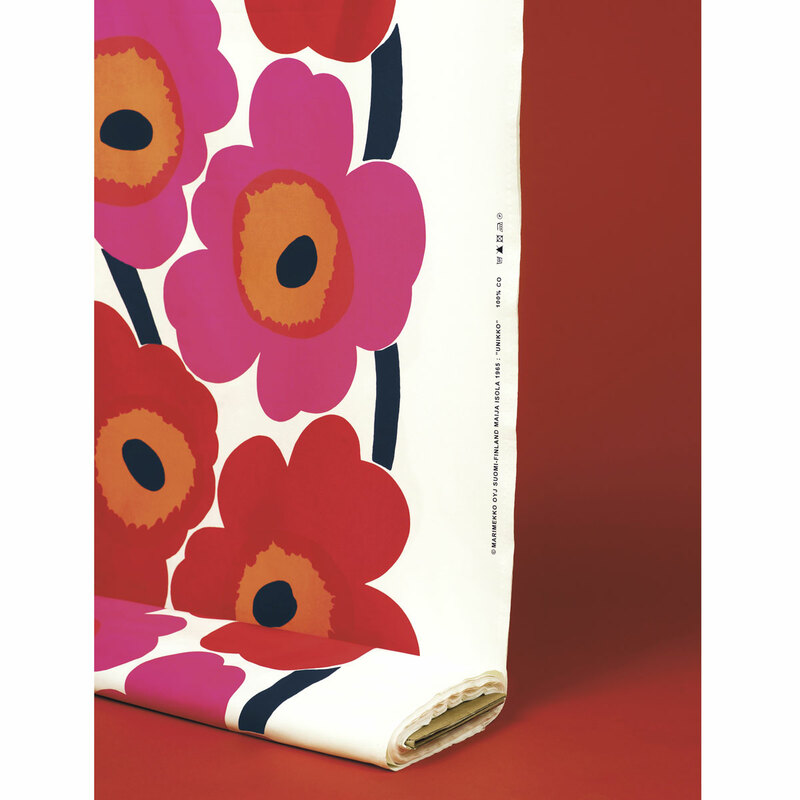 Fabric is cut from the bold and selection will vary.The photo shows the fabric pattern as if the cut edges were at the top and bottom; selvage with Marimekko name will appear on the sides. Just beautiful and will make a lovely wall haging in my bathroom/bedroom re-do! 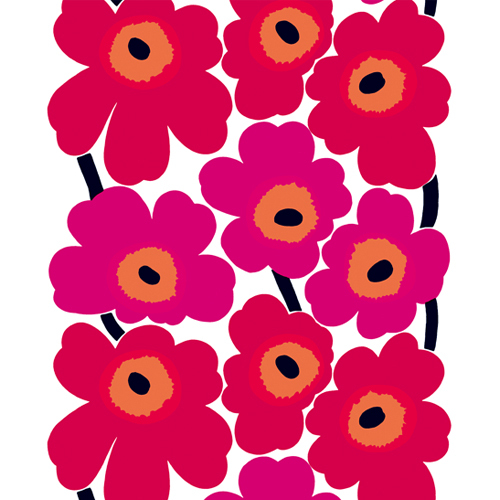 Classic Marimekko design - these flowers are 24" across. ConsDescription doesn't tell you how big the flowers are in the print - had to adjust my project when I discovered these flowers are 24" across. Just FYI. I had no idea that one side would have the printed logo above the selvedge, eating up another 1 1/2 inches of usable material width. If a fabric can express emotions and atmosphere, this one says DRAMA and JOY! The flowers are huge ! Be warned! I love it. One yard of fabric will be 36" x 57", so one yard should be enough for you for one pillow. One yard would be 36" x 57" so it should be enough for one pillow. One yard is 36" x 57" so it should be enough for one pillow.